How to Crack Test of Reasoning: In All Competitive Exams has been designed for those who are preparing for any kind of competitive exam. These days, the reasoning section in any entrance exams carries a lot of weight. It tests the candidate's thinking power and mind-applicability skills. Only with enough practise can students become equipped to solve these problems. How to Crack Test of Reasoning: In All Competitive Exams is divided into three sections, which are further divided into multiple chapters. In the Verbal Reasoning portion, students can learn how to solve puzzles, link blood relations, complete number and letter series' and more. The second section is dedicated to Logical and Analytical Reasoning. The authors cover topics like syllogism, Venn diagrams and data sufficiency. The last portion focuses on Non-Verbal Reasoning. Students will come across chapters on mirror images, formation of figures and figure matrix. How to Crack Test of Reasoning: In All Competitive Exams comprehensively covers the subject material. Each of the chapters contain a wide array of questions, similar to those asked in various competitive tests. Furthermore, students will also find over two thousand questions that have appeared in previous years, in different tests like SSC, RBI, MBA, LIC, BEd and others. For the benefit of the candidates, the questions are paired with their detailed solutions. How to Crack Test of Reasoning: In All Competitive Exams is a guide that helps candidates prepare properly for competitive and recruitment examinations. The large number of questions in this book can help candidates understand the common trends in these exams. 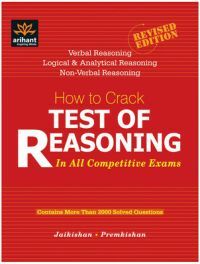 The revised edition of How to Crack Test of Reasoning: In All Competitive Exams, published by Arihant in 2014, is available in paperback.